When the Lightning Experience first came out it was difficult to justify migrating existing orgs to it because it lacked many features of Salesforce Classic. If a company were to immediately switch they would have invested time and money and lost functionality and in some cases the functionality would have been too critical to lose. Of course, users could always have switched back and forth between the Lightning Experience and Classic, but that would have been a significant efficiency loss for anything other than rare one-offs. Additionally, the effort to make the switch was proportional to the number of and complexity of customizations, which led more established orgs making heavy use of the Force.com platform to feel it was out of reach. This led organizations to put off spending any significant time on evaluating making the switch, figuring they’d come back to it at some later point. The Lightning Experience is now at a point where it makes sense to make the move, or at least to spend the time and effort to seriously evaluate it and come up with a in-depth detailed plan to execute in the future. There are three important questions to consider when performing an analysis for the switch: (1) What will be gained? (2) What will be lost? (3) What will it take to switch? The question of what will be gained can be answered by looking at many of the Lightning Experience only features that greatly enhance productivity. There’s the Lightning Utility Bar, Notes, Related Record Component, Path, and Activity Timeline to name just a few. Look at the Compare Lightning Experience and Salesforce Classic for an exhaustive list. If you are planning any development initiatives involving Classic, you should consult that list to see if you are going to develop something for Classic that exists for free or has something compatible in the Lightning Experience. Additionally, each release has more new features that are Lightning Experience only, so what will be gained will increase. The question of what will be lost is approaching nothing too important or nothing for many organizations. One of the sticking points for Service Cloud users was the console, which is now available in the Lightning Experience (though Live Agent was not yet). See What are the Gaps Between Lightning Experience and Salesforce Classic and What’s the Fate of Existing Salesforce Customizations for more details. Additionally, the gaps continue to get closed with each release, so what will be lost will grow smaller with each release. What will it take to switch? That leaves the question of what it will take to switch. There are two distinct aspects to consider. There is the cost of the work getting the org to function as needed in the Lightning Experience and training of the existing users to use it. The training of the users should not be too difficult, given resources available from Salesforce. There are many Trailhead modules about Lightning such as Lightning Experience Basics, and it is a mostly intuitive interface. If there are custom app changes they would need to be addressed as well. Admins need more training time as they will be required to do more in the org and support the users, though much of that time will really come from the admin’s part of getting the org to function as needed in the Lightning Experience. 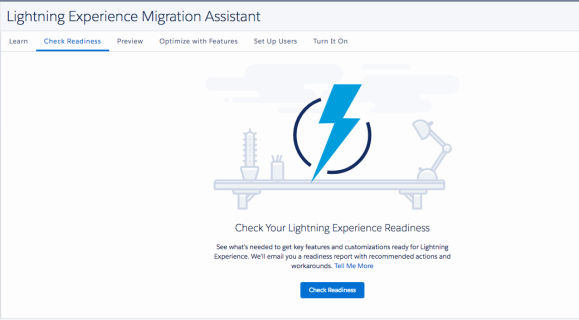 Getting an idea of the cost of the work in getting the org to function as needed in the Lightning Experience is more challenging, but Salesforce has provided a great tool to make that simpler with the Lightning Experience Migration Assistant, including the automated Lightning Readiness Check tool. The automated check scans the org for potential problems and produces a PDF report containing specific issues or potential issues about the org. From the report, someone can perform an analysis of the issues and classify their importance to the org and the level of effort in addressing them. Lastly, Salesforce provides the ability to enable or disable the Lightning Experience on a user by user basis, so it can be turned on for a select few in a pilot and gradually rolled out to more. There are many reasons why the time to make the switch has come. From a developer’s perspective, many of the development hurdles have been overcome. I will be exploring different aspects of developing for the Lightning Experience, focusing primarily on features that are beneficial over Classic or that aide in migrating from Classic and publishing my observations and conclusions on this blog. Nice post Peter Knolle, this is a really good information for the Organizations that are trying to migrate from Classic to Lightning experience – Thank you! Your site has certainly supplied me personally with merely the info that I actually required. to discover a website that delivers all the data which i will need. I would like to thank you foor tthe efforts you’ve put in penning this blog.